Just as promised, Apple released a new, 11.2.2 update for iOS that will patch the Safari browser used on its iPhones and iPads from the Spectre vulnerability, adding to the Meltdown patch in 11.2. Apple warned that the update may slow Safari down a bit, as you can see in the excerpt below, but those gaping chip vulnerabilities that are raging this season aren't ones you can afford to stay open against. Our current testing indicates that the Safari mitigations have no measurable impact on the Speedometer and ARES-6 tests and an impact of less than 2.5% on the JetStream benchmark. Slowly but surely iOS is a carbon copy of Androids features including lagginess and fragmentation. On my 12.9 Pro, and X, iOS is a bug filled glitchy OS. It's honestly nothing I can't handle, but the bugs are there often. I'm shocked Apple is still battling bugs at this point. Cnour, I have some Charmin for you. You don’t own a X...you just say you do so you can be a cool kid and go after Apple. In the article Android Oreo Update Pace Is Still Slow, you said you buy nothing but Notes and Galaxy S. If iOS is such a buggy mess, what reason other than to troll, would you claim to get the IPad Pro over something like the Tab S3? I don't like iOS yet I have an iPad Pro 10.5, shocking eh? And I guess my eyes were deceiving me, it must be someone other than DJ who sent me pictures of his 256 Black iPhone X? These iFolks dont realize the difference between an iOS user, and an iOS fanboy...I'm a user. Let him and the flock continue to call me a liar, I actually find it funny. IPads and iPhones, are so cheap on CRAIGSLIST, anyone who wants one can easily obtain it bro. He'll mow think you're a liar as well...we both know the truth though. I honestly don't care what he thinks about me. I just found it kinda amusing how he's accusing one Apple's oldest fans on this site to lie about what iProducts he has. I guess he's new to this site. New perhaps...blind definitely. You know they fell, you can’t be an Apple fan, and tell it like it is...according to the flock. When I said I buy Notes and Galaxy S, I was pertaining to android devices. I have about 50 movies, maybe 100 TV shows (lotsa Dave Chapelle), over 1,500 songs, and 40 +music videos on my iPad since I've had one, since 2010. I also have quite a few iOS exclusive apps, like all in notes. That iOS content won't be coming to a Galaxy Tab, and there's no need for it to. I'm a fan or iOS, but not a fanboy or blind sheep. I call it like I see it, and iOS needs more features and stability. I've used iOS since July 10th 2007, when I bought my first iPhone, and I've liked the OS since. You're also a liar. I never said (nothing) but Notes and Galaxy S. I said "only", and that pertains to android devices. Consider this my being respectful to you. I won't explain myself again. I updated our iPad Pro 9.7, iPhone 8 and iPhone 8+ today. I don't see any observable slowdown in the 3. Have an iPad mini 4 just updated to iOS 11.2.2 funny thing safari performs better than iOS 11.2.1! Used to be slow with 11.2.1. 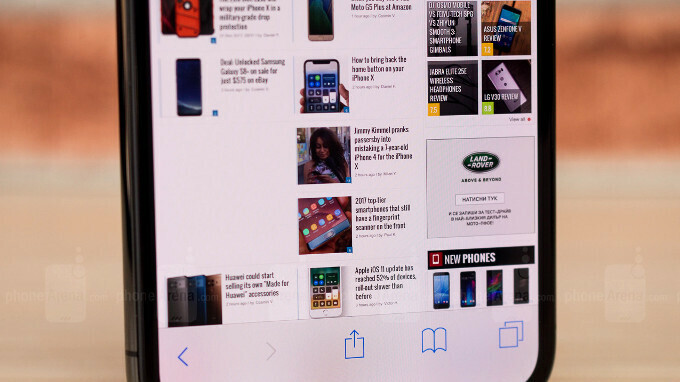 Anyone know why Chrome is so much faster on iOS and slower on Android in page and content loading? I have the iPhone 7 Plus Unlocked model and the Google Pixel XL. I noticed that Chrome on iOS is even faster then Safari but on the Android version it is not as fast as on iOS.